What makes Maitreya Mountain Village’s multi-functional Hobbit Hole so eco-friendly is that it’s constructed of concrete. Yes, you read that right. An overgrown lot with a dilapidated house transforms into an urban permaculture oasis thanks to the efforts of the Bread and Roses Collective in Syracuse, New York. So you want to design, build, and live in community in the most ecologically positive building that can be built? After a decade-long pursuit of that goal, a co-creator of Capitol Hill Urban Cohousing recounts lessons learned along the way. Earthsong Eco-Neighbourhood offers their mistakes, successes, and learnings in the hope of encouraging the wider use of natural building materials and systems in cohousing projects. At Earthaven Ecovillage, the experience of planning, building, working with others, and living in the sensual, earthy “Leela”—part temple, part hideaway—proves to be a dream come true. 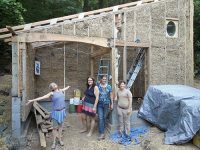 At this cooperative ecovillage, the barn is magical, a space that will make a liberating special meeting area, meditation nook, reading loft, and more…once, after nine long years of building, it is done. 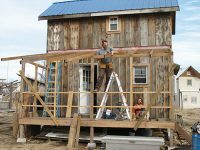 Yes, you can build your own house; you don’t have to do it alone; you don’t have to do it all…and 18 more tips from a professional builder who learned his trade at Dancing Rabbit Ecovillage. 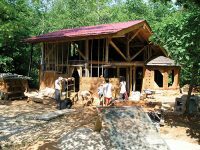 Having built the strawbale house of her dreams, a Tolstoy Farm resident encourages others to use natural building and eco-materials to construct durable, nontoxic, low-impact, energy-efficient, and creative structures. Eco-building in community offers both opportunities and challenges, benefits and potential drawbacks, as compared to doing it alone. Becoming a general contractor for a project way beyond one’s abilities can be a powerful, humbling, community-building learning adventure, especially when the house is made of horse manure. 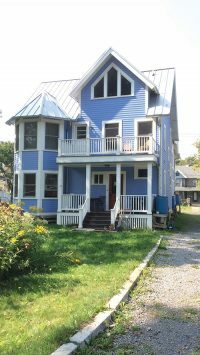 For reasons both practical and ideological, intentional community has long been a hotbed of eco-building activity. 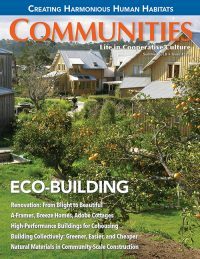 In Communities’ “Eco-Building” issue (Summer 2018, #179), authors share their eco-building journeys, ranging from nearly-free stick-framed shelters to high-end green developments. 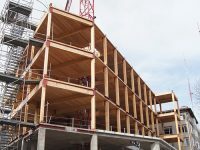 They examine how to assess whether a building is actually “eco,” hard choices they’ve needed to make, the benefits and challenges of taking on eco-building projects in community, or of retrofitting vs. building new, and much more. Once again, the issue is available via free/by donation digital download at ic.org/communities.